Energy is crucial to the functioning of any human society and central to understanding East Asia’s ‘economic miracle’. The region’s rapid development over the last few decades has been inherently energy-intensive and the impact on global energy security, climate change and the twenty-first-century global system generally is now very significant and will become more so over foreseeable years and decades to come. The region is already the world’s largest energy consumer and greenhouse gas emitter, so establishing cleaner energy systems in East Asia is both a regional and global challenge, and renewable energy has a critically important part to play in meeting it. 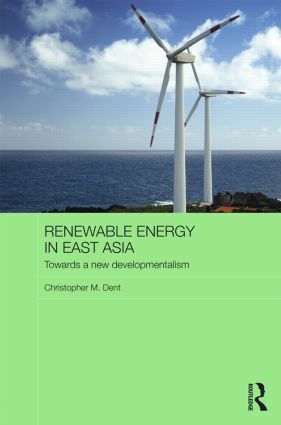 This book presents a comprehensive study of renewable energy development in East Asia. It begins by examining renewable energy development in global and historic contexts, and situates East Asia’s position in the recent worldwide expansion of renewables. This same approach is applied on sector-specific chapter studies on wind, solar, hydropower, geothermal, ocean (wave and tidal) and bioenergy, and to general trends in renewable energy policy. Governments play a critical role in promoting renewables and their contribution to tackling climate change and other environmental challenges. Christopher M. Dent argues this is particularly relevant to East Asia, where state capacity practice has been increasingly allied to ecological modernisation thinking to form what he calls ‘new developmentalism’, the principal foundation on which renewables have developed in the region as well as how East Asia’s low carbon development is being generally promoted. Renewable Energy in East Asia will be of huge interest to students and scholars of Asian studies, economics, political economy, energy studies, business, development, international relations and environmental studies. It will also appeal to researchers working on the subject matter in government, business, international organisations, think tanks and civil society organisations. Christopher M. Dent is Professor of East Asia’s International Political Economy at the University of Leeds, UK.